Auto efficiency: how much is on the horizon? Everyone appreciates how higher fuel efficiency is important for controlling oil use and greenhouse gas (GHG) emissions. Although efficiency can be given a big boost by making a vehicle all-electric, plug-in cars have limitations as well as high costs. And so a key question is this: how much can we improve the fuel economy of "grid-free" automobiles that still use only gasoline? Most technologies can progress quite a lot given sufficient time, but policymakers concerned about climate want to cut GHG emissions substantially by mid-century. Because it takes roughly 15 years to replace the on-road stock of cars and light trucks, the relevant question becomes that of how much more efficient new vehicles could be by 2035. An answer is provided in a recent report, A Fuel Efficiency Horizon for U.S. Automobiles. This study examines how far auto efficiency can be taken if it is pursued with determination, using technology and design options that offer a "revolution by evolution." It turns out that quite a lot of progress can be made through ongoing refinements to vehicles that still rely on internal combustion engines as their sole and prime mover. Costs are involved, but much less than the costs of electric and other alternatively fueled vehicles (AFVs), which face infrastructure barriers and other market challenges. The engineering available to make such progress includes turbocharged gasoline direct-injection engines, low-emission turbo diesels, a range of hybrid drive options (short of plugging in), advances in lightweight steel and other mass-efficient material and design solutions. Such options can offer steady advances in line with rates of technology adoption that have been demonstrated historically in the auto market, where innovation is relentless even when not focused on fuel efficiency. Given the engineering competition among automakers and suppliers, the costs of technology improvement can be held down through budget-constrained product planning and productivity gains. The result of such an analysis is that a tripling of new car and light truck fuel economy is an ambitious but defensible fuel efficiency horizon for 2035. This graph shows a pathway from a recent (2005) new fleet baseline toward such a level, which the study finds would be both be technically achievable and cost-effective. This graph is expressed in terms of new fleet average energy intensity (kilojoules per meter, kJ/m, similar to Btu/mile), with historical averages and the levels implied by recent regulations shown for comparison. The right-hand axis gives corresponding nominal fuel consumption rates (liters per 100 kilometers, L/100km, based on unadjusted lab tests), which fall from 9.5 L/100km to 3.2 L/100km over the 25 year horizon 2005-2035. Historically, a drop of comparable magnitude (roughly 6 L/100km) happened over 12 years, 1975-1987. 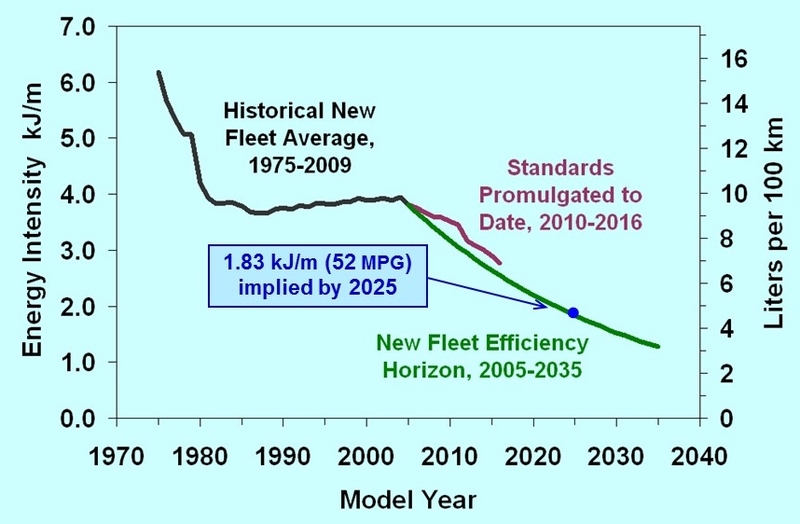 In terms of nominal, lab-test fuel economy, this trajectory would take the new U.S. car and light truck fleet from 25 mpg in 2005 to 74 mpg in 2035; those are fuel economy values similar to those used for CAFE standards, but are higher than what consumers experience in the real world. The recent real-world average of the combined car and light truck fleet has been about 20 mpg, and on that basis, the efficiency horizon for 2035 works out to 60 mpg, i.e., still a tripling of fuel economy in relative terms. However one measures it, that would be quite an advance and more than enough to start bending the curve downward for automotive GHG emissions.